Remember when I called WPP 5 years ago and it ran from 6c to 30c? Well this company is much better because it's got similar production, less shares, profitable and growing even in this environment. 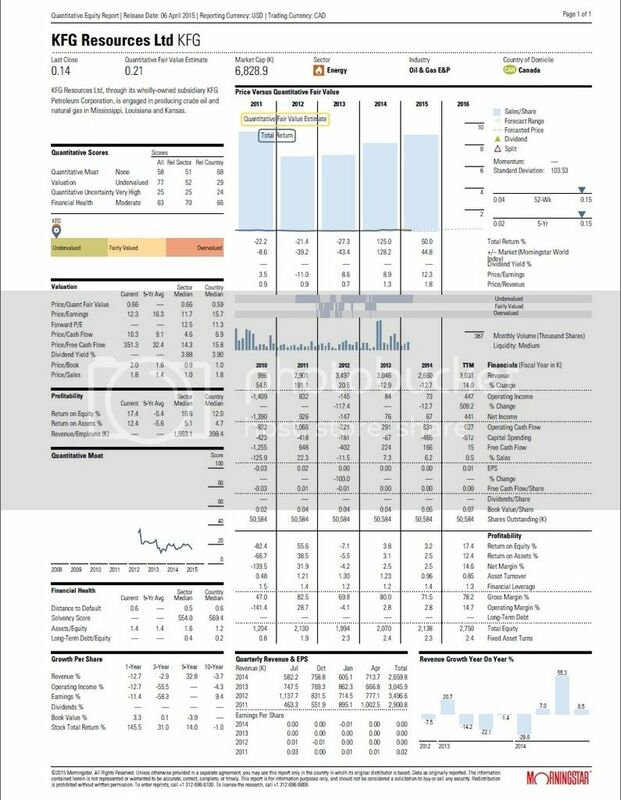 Information from their last financial report below. Overall the Company has recovered from giving up 25% of its interested in the Fayette Field wells at payout. Currently, with the MacNeil wells and Craig wells at payout, revenues are on a growth pattern again. The Company was able to grow just utilizing cash flow. Several new projects are in the pipeline and the Craig #3 well will payout in the next few months increasing that revenue stream. KFG will have no problems financing growth through its internal cash flow throughout the remainder of its fiscal year ending April 30, 2015. In addition, the Barnum #2 well is on production as of mid September 2014. The Craig #4 well was recently completed as a dryhole. With the Company’s current cash position and a quick ratio of 2.5, theCompany is in a good position to weather the current collapse in oil prices from about $84 in October 2014 to around $55 - $60/bbl at this writing and will still show positive cashflow. The Company’s operating cost per bbl is currently $18.85/bbl.